iTop is getting slow due to a high volume of tickets? You would like to get rid of them, but… what if a customer claims for an old ticket? Install this extension and you will gain performance, without loosing data. Improve performance when searching for a Ticket, if your outdated Tickets represent much more than the active ones, but cannot be deleted. Hide Archived Tickets to all users most of the time, as if they were deleted. But still enable them to retrieve Archived Tickets if needed. 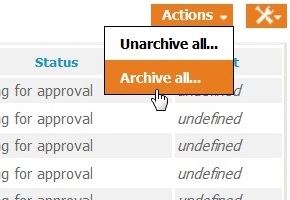 Bulk archive/unarchive does not record the change in the object change history, whereas archiving/unarchiving a single object does record the information in the change tracking. When you have deployed this extension, then Tickets objects can be massively archived (and unarchived) by administrators only. 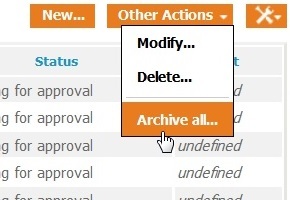 Both single object archive and unarchive actions are done without confirmation. All archived objects are hidden, for all users including admins, like if they were deleted. A reference to their friendly name can be found in other objects pointing to them. Example on an archived contact which is the caller of a non-archived Change. As you can see the link is inactive, you can't open the caller details. In archived mode, you have a orange tag to remind you that you have activated it.